A beautifully bound copy of Scottish poet Robert Pollok’s much admired epic poem, first published to great acclaim in 1827. Often compared to Milton’s Paradise Lost, the poem explores grand themes, such as biblical ideas of the apocalypse to Scottish Romantic philosophy. Pollok’s work was an immediate success, and subsequently twenty-five editions were printed over the course of fifty years, with more than 60,000 copies sold. A finely bound work. 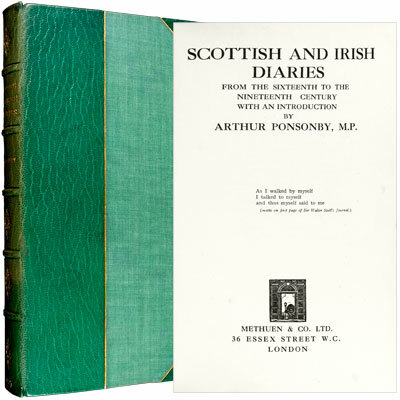 In addition to notes and extracts for the major diarists, Ponsonby provides a detailed introduction, and notes on minor Scottish and Irish Diarists, chronological lists of both. Those he considers major diarists include Sir Walter Scott, Lord Cockburn, Jane Welsh Carlyle, Richard Boyle, John Wilson Crocker, Swift, Wolfe Tone, Daniel O'Connell, Tom Moore, and John Mitchel, among others. Arthur Ponsonby, first Baron Ponsonby of Shulbrede (1871-1946), was an English politician, writer and peace campaigner. He was born in Windsor Castle, the youngest son of Queen Victoria's private secretary. - Oxford Dictionary of National Biography. 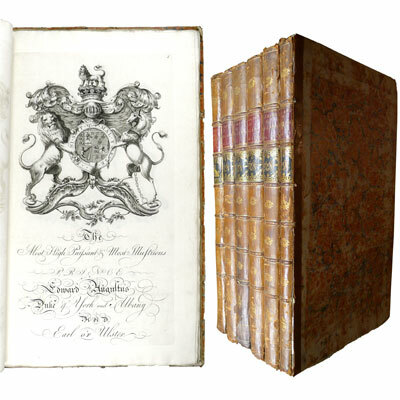 In four small finely bound volumes, with engraved frontispiece and engraved title to each volume. A fine and magnificently bound edition. Important association copy, inscribed by Ramsay to Doctor Robert Carruthers of Inverness, with Ramsay’s hand written note going on to say that this ‘is the 20th edition and I suppose to be my last - the concluding part from page 316, on the subject of a “closer union amongst Christians is entirely new in the Edition’. Dr. Carruthers is also thanked by Ramsay in the introduction (see page X). This work actually went through a further two editions before Ramsay’s death in 1872. 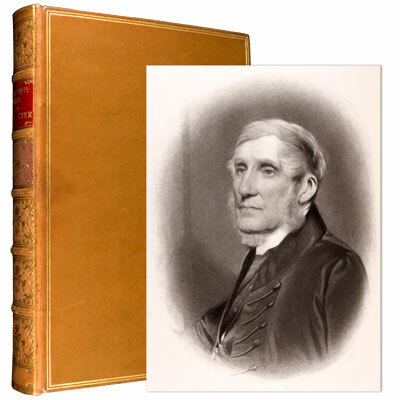 First published in 1857, and extended throughout Ramsay’s life, it consists of his personal recollections, anecdotes and opinions. In addition to the entertaining preface, chapters cover Scottish Religious Feelings, Old Scottish Conviviality, The Old Scottish Domestic Servant, Humour Proceeding from Scottish Expressions Including Scottish Proverbs, and Scottish Stories of Wit and Humour. ‘I can see it being read aloud on a thousand sandy beaches and as a special treat in bed to inspire further ideas for the morrow's adventures. Mr. Ransome's delightful children show how easy it is with a touch of the right sort of imagination to capture all the thrills of "Treasure Island" and "Robinson Crusoe" without going further afield than the next cove. All you need is a boat, a parrot, a black spot, a sea-chest (preferably covered with foreign labels), molasses, a smattering of seamanship and nautical language, a thunderstorm, and an enemy. The enemy is most important. Mix these ingredients judiciously and you get as fine a setting for voyages of discovery as ever inspired a Jason or a Raleigh.’ - S.P.B. Mais, Daily Telegraph, August 1930. Social and Diplomatic Memories 1884-1893 - Sir James Rennell Rodd G.C.B. The autobiography of 1st Bron Rennell (1858-1941), British diplomat, poet (Oscar Wilde assisted in publishing Rodd’s first book of poems), politician, and scholar of ancient Greece and Rome. Covering the early years from his childhood, the ‘Balliol set’, and young Bohemian adulthood, to his first posting in Berlin from 1884 to 1888, where he became an intimate friend of the Empress Frederick, and recounts his memories of Bismark and other major figures during that tumultuous time, after this he moves on to Greece, Italy, France, and finally Zanzibar and East Africa at the end of the 19th century. 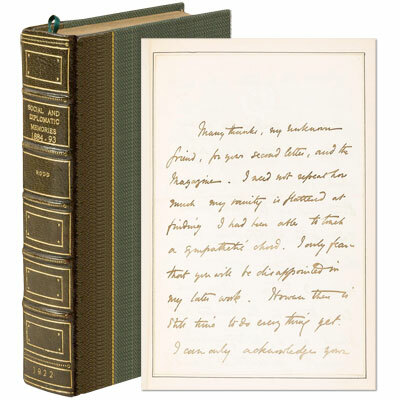 Finely bound and with a four page hand-written letter from his wife to an ‘unknown friend’, composed at the British Legation, Athens in February 1928. The most beautifully illustrated and comprehensive record of 18th century Heraldry. A magnificent and extremely rare complete set of six large uncut folio volumes, with 658 copperplate engravings (104 of which are double page) many by the master engraver Francesco Bartolozzi a founder member of the Royal Academy. The plates consist of 279 coats-of-arms (3 double-page), 364 genealogical tables (101 double-page), six titles, six dedication pages, and three specific family dedication pages. Ranked to begin with Royalty, this massive work took 20 years to produce, making it necessary to publish a supplement with new peerages. Provenance - Sir John Smith, Bart., F.R.S. of Sydling St.Nicholas, Dorset, whose initials JS are gilt-stamped to the morocco spine labels and engraved bookplates to the front pastedowns.